In addition to functioning as a ligand to engage TCRs and drive TCR signaling, MHC class II molecules are signaling molecules that generate a number of signals within APCs, such as B lymphocytes. Moreover, MHC class II signaling is critical for B cell activation and development of a robust humoral immune response. Murine class II molecules exist in two distinct conformational states, based primarily on the differential pairing of transmembrane domain GxxxG dimerization motifs (i.e., M1- and M2-paired class II). This laboratory has previously reported that the binding of a multimerized form of an anti–class II mAb that selectively recognizes M1-paired I-Ak class II drives intracellular calcium signaling in resting murine B cells and that this signaling is dependent on both src and Syk protein tyrosine kinase activity. In contrast, multimerized forms of two different anti–I-Ak mAbs that bind both M1- and M2-paired class II fail to elicit a response. In this report, a flow cytometry–based calcium flux assay is used to demonstrate that coligation of M1- and M2-paired I-Ak class II results in the active and selective inhibition of M1-paired I-Ak class II B cell calcium signaling by M2-paired class II molecules. Because M1- and M2-paired class II can be loaded with different sets of peptides derived from Ags acquired by distinct pathways of endocytosis, these findings suggest an MHC class II signaling–based mechanism by which CD4 T cells of differing specificities can either enhance or suppress B cell activation. The most widely appreciated function of MHC class II (MHCII) molecules is to present Ag-derived peptides to CD4 T cells to either drive activation of naive CD4 T cells (dendritic cells) or recruit T cell help (B lymphocytes and macrophages). However, MHCII molecules are also signaling molecules, and MHCII signaling has effects on all three types of APCs mentioned above. Yet, our understanding of the molecular mechanisms of MHCII signaling is incomplete. MHCII molecules can activate multiple distinct downstream signaling pathways (reviewed in Refs. 1–3). The cytoplasmic domain of the MHCII αβ heterodimer can directly activate an adenylate cyclase to drive cAMP production, which results in activation of protein kinase C (PKC) and B cell activation (4) (reviewed in Refs. 1, 2). In contrast, MHCII can activate an src/Syk-dependent signaling pathway, likely via an associated signaling molecule (see below), that results in a downstream intracellular calcium response (reviewed in Refs. 1, 3). This second protein tyrosine kinase (PTK)–dependent signaling pathway has been linked to the activation of both dendritic cells (5) and B cells (1, 3, 6–9). In B cells, PTK-dependent MHCII signaling occurs via class II–associated signaling molecules such as CD20 (10) or CD79 (3, 7, 11). The class II–associated CD79 signaling molecule bears an ITAM and is likely acquired from the BCR (3, 11–13). PTK-dependent MHCII signaling also requires membrane microdomains colloquially termed “lipid rafts” (14–16). Association of MHCII molecules with CD79 and lipid rafts is controlled by different regions of the class II molecule. Interactions between MHCII and CD79 depend on the MHCII α-chain connecting peptide (i.e., the region of the α-chain linking the extracellular and transmembrane [TM] domains of the molecule) (7). In contrast, the MHCII TM domain controls class II association with lipid rafts either by being a target of palmitoylation (17, 18), binding membrane cholesterol (19, 20), and/or via differential pairing of TM domain GxxxG dimerization motifs (21, 22) (the biology of the MHCII TM domain structure and function was recently reviewed in Ref. 23). MHCII PTK-dependent signaling can be influenced by the state of B cell activation and MHCII isotype. In human B cells, HLA-DR molecules can readily activate downstream PTK signaling, whereas HLA-DP molecules appear to lack this ability (10). In murine B cells, MHCII PTK activation was initially thought to require B cell “priming” by exposure to either cognate Ags or IL-4 (3, 11). However, this laboratory has been able to elicit MHCII PTK signaling in resting murine B cells using multimerized anti-MHCII mAbs (24). In resting B cells, activation of PTK-dependent class II signaling is highly dependent on the fine specificity of the anti-MHCII mAb used (discussed below) (24). The goal of this study was to better understand the differential induction of MHCII PTK-dependent signaling by different anti-MHCII mAbs in resting murine B cells, with the expectation that the results of the study will contribute to a better overall understanding of the molecular mechanisms of MHCII signaling. B10.Br mice were purchased from The Jackson Laboratory (Jax stock no. 000465). Animals were housed in the Albany Medical College Animal Resource Facility under specific pathogen–free conditions. The Albany Medical College Institutional Animal Care and Use Committee approved all reported protocols. The following immunological reagents were used for these studies: 11-5.2-biotin (btn) (Pharmingen 558794), 10-3.6-btn (Pharmingen 553539), 10-3.6 (BioLegend 109902), F(ab′)2 fragment of goat anti-IgM (Jackson ImmunoResearch 115-006-075), 14-4-4S-btn (Pharmingen 558735), 2.4G2 (Pharmingen 553140), 2.4G2-btn (Pharmingen 553143), RA3-6B2 αCD45R (Pharmingen 553084), RA3-6B2-btn (Pharmingen 553086), anti-B220(CD45R)-PE (Pharmingen 553090), 11-5.2-FITC (Pharmingen 553536), anti-CD90.2-PE (BioLegend 105308), and streptavidin (SA; Jackson ImmunoResearch 016-000-113). A single-cell suspension of total B10.Br splenocytes in HBSS (with Ca2+ and Mg2+) 0.1% BSA was passed through a 70-μm nylon mesh to remove connective tissue fragments. Splenic lymphocytes were collected by centrifugation over Ficoll-Paque (catalog no. 17-1440-02; GE Healthcare) according to the manufacturer’s instructions. Splenic lymphocytes were collected from the buffer–Ficoll-Paque interface and washed two times with HBSS 0.1% BSA. For some experiments, splenic B cells were isolated with the Miltenyi Biotec mouse B cell isolation kit (130-090-862), following the manufacturer’s directions. The calcium flux results obtained with total splenic lymphocytes or purified splenic B cells were indistinguishable. Splenic lymphocytes were labeled with 1 μg/ml Fluo-3 (Molecular Probes F1242) and 2 μg/ml Fura Red (Molecular Probes F3021) for 30 min at 37°C in HBSS 0.1% BSA 2.5 mM probenecid, as previously reported (24). When whole splenic lymphocytes were used, T cells were fluorescently “tagged” by incubation of the splenocyte preparation with 1 μg/ml anti-CD90.2-PE, followed by washing. For the activation studies, 450 μl of labeled cells (2 × 106 viable cells/ml) were placed in FACScan tubes and rested for 30–60 min at room temperature in the dark. Samples were prewarmed to 37°C for 5 min prior to stimulation and analysis (the total volume of the added stimulant[s] was ≤ 50 μl). Cells were stimulated with 5 μg/ml anti–MHCII-btn, which was subsequently cross-linked with 10 μg/ml SA (Jackson ImmunoResearch 016-000-113). Inhibitory Abs were used between 5.0 and 0.05 μg/ml final concentration. Samples were analyzed on a BD FACScan flow cytometer as previously reported (24). Data were analyzed with FlowJo software, version 9.9.4. Postacquisition, each sample was gated on lymphocytes by FCS and SSC. When whole splenocytes were used, B cells were distinguished by gating on CD90.2-PE–negative lymphocytes. Using the kinetics platform, the median FL1/FL3 ratio was plotted with Gaussian smoothing applied. Overlays of multiple samples from a single experimental run provide benchmarks for the interpretation of experimental findings. For all figures, representative results from one of multiple independent replicate experiments are shown. To allow comparison of results across experimental runs, we determined the area under the curve (AUC) for the FL-1 (Fluo-3) channel for 10 s at maximal response and then subtracted a 10-s prestimulation AUC. The background-corrected AUC for treated samples is reported as a percentage of the corrected-control AUC (11-5.2 or 14-4-4S). The average “percent of control” value across multiple experiments was then compared between different inhibitory treatments. Previous work from this laboratory reveals that the Ia.2 epitope recognized by the 11-5.2 anti–I-Ak mAb marks a conformationally distinct subset of ∼10% of MHCII molecules (21, 22). Follow-up studies reveal that Ia.2 epitope formation is dependent on a specific geometry of MHCII TM domain GxxxG dimerization motif pairing (22, 25, 26) (Fig. 1A). Specifically, Ia.2+ I-Ak molecules have the single β-chain GxxxG motif paired with the α-chain N-terminal M1 GxxxG motif (i.e., M1-paired MHCII [M1 MHCII]). In contrast, Ia.2– I-Ak molecules have the β-chain GxxxG motif paired with the α-chain C-terminal M2 motif (i.e., M2-paired MHCII [M2 MHCII]). Further study defined three molecular regions involved in the formation of the Ia.2 epitope that marks M1-paired I-Ak MHCII [i.e., TM domain GxxxG motif pairing/cholesterol binding (19, 20, 22, 23, 25, 26), α-chain Glu-71 (25), and the α-chain Arg-52–β-chain Glu-86 interchain salt bridge (25)]. This foundational work has led to the development of the M1/M2 hypothesis [Fig. 1A, (23, 27)]. Although M1- and M2-paired conformers of human HLA class II molecules have yet to be immunologically identified, all three isotypes of human class II possess the same GxxxG motif distribution as mouse I-A and I-E molecules (27), and biophysical and in silico studies have shown both M1 and M2 pairing of HLA-DR and HLA-DQ TM domains (13, 23, 26). Ia.2– M2 I-Ak blocks Ia.2+ M1 I-Ak class II calcium signaling in resting B cells. (A) Diagram of differential pairing of MHCII TM domains, based on alternative pairing of the single β-chain GxxxG motif (M) with either of the two α-chain GxxxG motifs [M1 and M2 (22)]. Green illustrates M1 MHCII, and red illustrates M2 MHCII. (B) Flow cytometric analysis of the binding of the 11-5.2 anti-M1 I-Ak mAb to isolated splenic B cells. (C) Diagrams of M1 I-Ak MHCII cross-linking by 11-5.2-btn plus SA in the absence (Ca) and presence (Cb) of nonbiotinylated 10-3.6 mAb. (D) Time lines of B cell stimulation with anti-MHCII mAb with simultaneous (Di) or prebinding (Dii) of the 10-3.6 mAb. (E) Intracellular calcium flux elicited by multimerized 11-5.2 mAb in the presence or absence of nonmultimerized 10-3.6 mAb added either at the same time as 11-5.2-btn (i, Concurrent) or 5 min prior to 11-5.2-btn addition (ii, Pre-binding). Shown are representative results from one of four or more independent experiments. Although Ia.2– M2 MHCII represent ∼90% of cell surface I-Ak class II molecules (21), Ia.2+ M1 MHCII are enriched in lipid rafts (21) and selectively loaded with peptide derived from the processing of BCR-bound Ags (12). Moreover, the 11-5.2 mAb, which selectively binds M1-paired I-Ak MHCII (21, 22), profoundly blocks both in vitro (21) and in vivo (28) B cell–T cell interactions, indicating a central role for Ia.2+ M1 MHCII in B cell immunobiology (13). This laboratory has previously shown that a multimerized version of the 11-5.2 anti-Ia.2+ M1 I-Ak mAb (i.e., SA multimerized 11-5.2-btn) is capable of eliciting an src/Syk-dependent (i.e., PTK-dependent) intracellular calcium response in resting B cells, whereas multimerized 10-3.6 anti-I-Ak mAb, which binds all (i.e., both Ia.2+ M1 and Ia.2– M2) I-Ak MHCII molecules, fails to elicit such a response (24). This second observation suggests that Ia.2– M2 I-Ak MHCII possesses a mechanism to attenuate Ia.2+ M1 MHCII PTK-dependent calcium signaling. The goal of this study was to better define the roles of Ia.2+ M1 and Ia.2– M2 (i.e., M1 and M2) MHCII in B cell PTK-dependent class II signaling. I-Ak–bearing splenic lymphocytes were isolated from B10.Br mice by Ficoll-Paque. The resulting population of cells is >90% lymphocytes with all B220-positive B cells binding both the 11-5.2 and 10-3.6 anti–I-Ak mAbs, as previously reported [Fig. 1B, (21)]. The vast majority of non–B cells in this preparation are CD90-positive T cells. To facilitate analysis of minimally manipulated B cells, splenic lymphocytes were labeled with calcium-sensitive dyes as well as anti-CD90-PE to allow T cell exclusion by gating (see Materials and Methods). For some experiments, B cells were enriched by negative selection (see Materials and Methods). The results obtained with both types of lymphocyte preparations were indistinguishable. For analysis, lymphocytes were stimulated with multimerized anti-MHCII mAb (Fig. 1Ca), and the B cell calcium response was analyzed by flow cytometry (see Materials and Methods). To determine the effect of Ia.2– M2 MHCII on Ia.2+ M1 MHCII-driven B cell calcium signaling, B cells were treated with nonmultimerized 10-3.6 mAb (which tethers M1 and M2 I-Ak class II, Fig. 1Cb) as well as multimerized 11-5.2 mAb (which will selectively aggregate M1 I-Ak class II, Fig. 1C), and the B cell calcium response was monitored as previously reported (24) [the two anti–I-Ak mAbs bind distinct epitopes, and there is no cross-inhibition of binding (21, 25)]. As illustrated in Fig. 1D, 10-3.6 mAb was added either at the same time as multimerized 11-5.2 (concurrent binding) or a few minutes prior (prebinding). Under both conditions there is a dose-dependent inhibition of 11-5.2–elicited class II calcium signaling by the nonmultimerized 10-3.6 mAb, with a greater inhibitory effect observed under prebinding conditions (Fig. 1E). 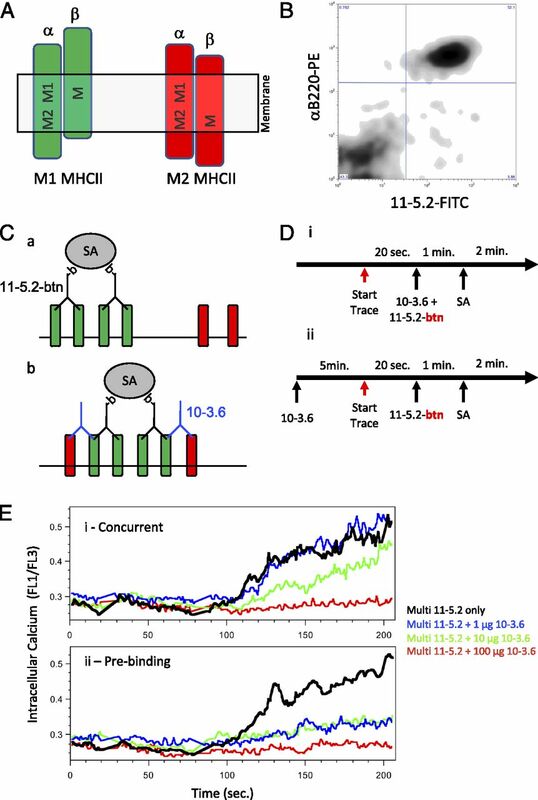 These results reveal that tethering of M1 and M2 I-Ak MHCII by nonmultimerized 10-3.6 mAb blocks the intracellular calcium signal normally elicited by exclusive cross-linking of M1 I-Ak class II by multimerized 11-5.2 mAb. To determine if the inhibitory effect of 10-3.6 binding is due to a global inhibition of B cell calcium signaling or to a more focused effect on Ia.2+ I-Ak class II signaling, the impact of 10-3.6 binding on BCR-driven calcium signaling was examined (Fig. 2). Nonmultimerized 10-3.6 mAb was added ∼5 min before BCR engagement (prebinding) to allow for any potential downstream effects (Fig. 2A). 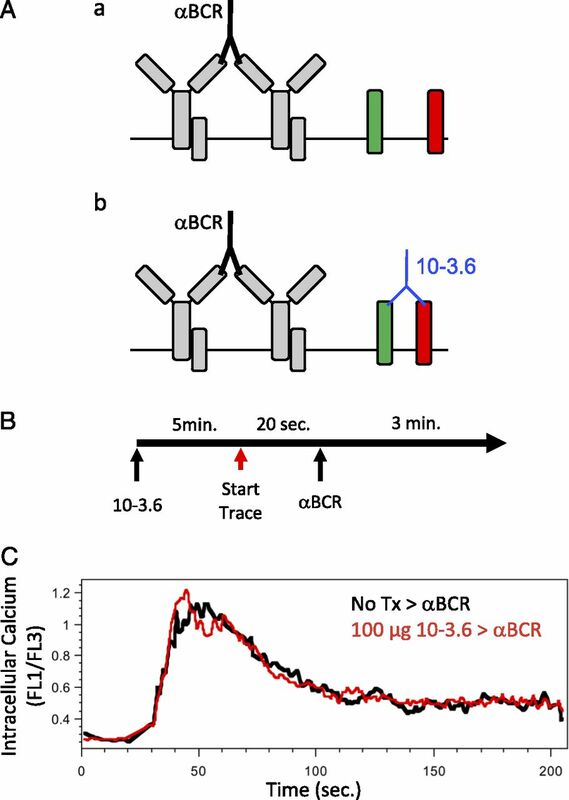 The BCR was then cross-linked with an anti-BCR Ab, and the B cell calcium response was monitored as above (Fig. 2B). As shown in Fig. 2C, binding of the 10-3.6 mAb has no detectable impact on BCR-driven calcium signaling, suggesting that the 10-3.6 mAb is not eliciting a state of global B cell nonresponsiveness. Prebinding of 10-3.6 also fails to alter the profile of calcimycin ionophore–elicited calcium flux (data not shown). These results reveal that 10-3.6 binding to total I-Ak MHCII molecules is not eliciting a state of global B cell nonresponsiveness. 10-3.6 engagement of I-Ak does not block BCR-driven intracellular calcium signaling. (A) Diagram of BCR cross-linking in the absence (a) or presence (b) of 10-3.6 mAb. (B) Time line of BCR engagement in the presence and absence of prebound 10-3.6 mAb. (C) BCR-driven intracellular calcium flux in the presence and absence of prebound 10-3.6 mAb (No Tx = no pretreatment with 10-3.6 mAb). In this same experiment, 10-3.6 prebinding led to a blockade of multimerized 11-5.2–induced MHCII signaling (data not shown). Shown are representative results from one of three independent experiments. To further probe the selectivity of the 10-3.6 effect, the impact of 10-3.6 prebinding to I-Ak class II on calcium signaling via coexpressed I-Ek class II molecules was determined (Fig. 3A, 3B). As shown in Fig. 3C, binding of a multimerized form of the 14-4-4S anti–I-Ek mAb elicits a B cell calcium flux similar to that elicited by multimerized 11-5.2, whereas nonmultimerized 14-4-4S elicits no detectable response (similar to the lack of response to nonmultimerized 11-5.2). However, in this case, prebinding of monomeric 10-3.6 anti–I-Ak mAb fails to inhibit 14-4-4S–induced I-Ek MHCII calcium signaling to the same extent that it inhibits I-Ak signaling (nonbiotinylated 10-3.6 inhibits I-Ek signaling by 24.1 ± 17.5% [n = 4], whereas nonbiotinylated 10-3.6 inhibits I-Ak signaling by 84.3 ± 15.7% [n = 5], p = 0.001). The partial inhibition of I-Ek signaling might be due to the binding of 10-3.6 (specific for an Aβk epitope) and 14-4-4S (specific for an Eαk epitope) either to mixed Eαk-Aβk class II molecules (29) or lipid raft-confined I-Ak–I-Ek complexes (30). Overall, this observation suggests that Ia.2– M2 I-Ak MHCII needs to be in close physical proximity to Ia.2+ M1 MHCII molecules to block MHCII calcium signaling (Fig. 1Cb). M2 I-Ak blocking of I-Ek MHCII calcium signaling requires direct I-Ak–I-Ek- cross-linking. (A) Diagram of I-Ek cross-linking by multimerized 14-4-4S in the absence (a) or presence (b) of 10-3.6 anti–I-Ak mAb. (B) Time lines of I-Ek–driven B cell activation in the presence or absence of 10-3.6 anti–I-Ak mAb. (C) Intracellular calcium flux elicited by multimerized 14-4-4S anti–I-Ek mAb in the presence or absence of 10-3.6 anti–I-Ak mAb. (D) Diagram of I-Ek–I-Ak cross-linking by 14-4-4S-btn plus 10-3.6-btn (followed by SA). (E) Time lines of I-Ek–driven B cell activation in the presence or absence of 10-3.6-btn anti–I-Ak mAb. (F) Intracellular calcium flux elicited by multimerized 14-4-4S anti–I-Ek mAb in the presence or absence of 10-3.6-btn anti–I-Ak mAb. Shown are representative results from one of three independent experiments (C and F). 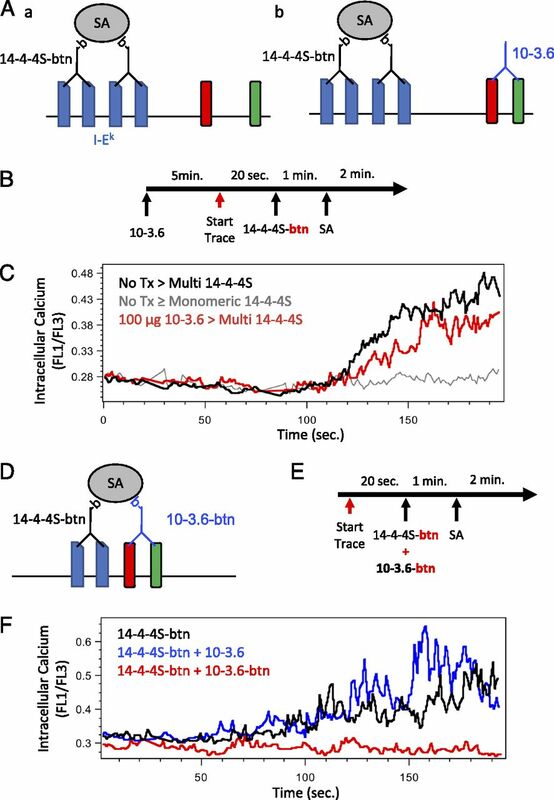 To confirm the idea that Ia.2– M2 MHCII inhibition requires physical proximity, we altered the experimental approach to include the use of biotinylated versions of both 14-4-4S and 10-3.6 (Fig. 3D), which will bring I-Ak and I-Ek MHCII molecules into close physical proximity upon SA addition. Under these conditions, 10-3.6 mAb is able to block 14-4-4S–induced I-Ek MHCII calcium signaling (Fig. 3F). These results indicate that I-E MHCII molecules are not immune to the inhibitory effect of Ia.2– M2-paired I-Ak MHCII and further support the concept that the inhibitory effect of M2 MHCII requires close physical proximity to Ia.2+ M1 MHCII molecules. MHCII-induced PTK-dependent calcium signaling in B cells broadly emulates BCR calcium signaling in that it requires src family kinase and Syk activity (24, 31) and is likely mediated by MHCII-associated ITAM-bearing CD79-signaling molecules (7, 11). The lipid raft partitioning of M1 MHCII (21) also suggests a key role for lipid rafts. To further probe the similarities between BCR and M1 MHCII signaling, the impact of MHCII coligation with two regulators of BCR signaling, CD45 and FcγRIIB, was determined. CD45 possesses a cytoplasmic phosphatase domain that can either augment or inhibit BCR ITAM signaling, and the CD45 protein is normally excluded from lipid rafts (32). FcγRIIB is an ITIM-bearing molecule, and BCR–FcγRIIB coligation results in local recruitment of phosphatases, such as SHIP, to attenuate BCR ITAM signaling (33). When B cells are stimulated with anti–MHCII-btn (either 11-5.2–btn or 14-4-4S–btn) and SA in the presence of nonbiotinylated anti-CD45 or anti-FcγRIIB (which will not tether CD45 or FcγRIIB to MHCII upon SA addition, Fig. 4A), there is no inhibition of MHCII signaling (Fig. 4D, 4E), indicating that simple engagement of either CD45 or FcγRIIB is not inhibitory. However, when B cells are stimulated with anti–MHCII-btn and SA in the presence of biotinylated anti-CD45 or anti-FcγRIIB (which will tether CD45 or FcγRIIB to MHCII upon SA addition, Fig. 4B), there is a profound block in MHCII calcium signaling (Fig. 4D, 4E). This result indicates that like BCR ITAM signaling, Ia.2+ M1 MHCII calcium signaling is susceptible to the inhibitory effects of local phosphatase activity and suggests that phosphatase activity associated with M2 MHCII molecules could be involved in the inhibition of M1 MHCII calcium signaling. This result also reinforces the requirement for close physical proximity between MHCII molecules for Ia.2+ M1–Ia.2– M2 MHCII cross-talk to occur. Cross-linking of the CD45R phosphatase or ITIM-bearing FcγRIIB to MHCII blocks MHCII-driven B cell calcium signaling. (A) Diagram of M1 I-Ak class II cross-linking by 11-5.2-btn + SA in the presence of 2.4G2 anti-FcγRIIB or RA3-6B2 anti-CD45R. (B) Diagram of M1 I-Ak–FcγRIIB cross-linking by 11-5.2-btn + 2.4G2-btn or RA3-6B2-btn (followed by SA). (C) Time line of MHCII engagement in the presence or absence of blocking mAb. (D) I-Ak–driven intracellular calcium flux elicited by multimerized 11-5.2 mAb in the presence or absence of anti-CD45R or anti-FcγRIIB mAb. (E) I-Ek–driven intracellular calcium flux elicited by multimerized 14-4-4S mAb in the presence or absence of anti-CD45R or anti-FcγRIIB mAb. Shown are representative results from one of two (αCD45) to four (αFcγR) independent experiments. In addition to presenting peptides to recruit either helper or regulatory CD4 T cells, MHCII molecules are signaling molecules, and these MHCII-driven signals can have a profound impact on B cell activation and the strength of a humoral immune response. Thus, an understanding of molecular mechanisms of MHCII signaling is an important part of our overall understanding of the humoral immune response. Numerous laboratories have reported that engagement of MHCII molecules can drive a PTK-dependent intracellular calcium response in B cells, which can drive B cell proliferation/activation. Notably, the Cambier laboratory demonstrated that this calcium response emanates from MHCII-associated CD79 molecules, which is usually thought of as the signaling subunit of the BCR (7, 11). These MHCII-associated CD79 molecules are likely derived from the BCR (11), with the class II–CD79 coupling possibly occurring during BCR–MHCII association in late endocytic compartments (12). Our previous studies revealed that two anti–I-Ak MHCII mAbs, 11-5.2 and 10-3.6, profoundly differ in their ability to elicit calcium signaling in resting murine B cells (24). Although the 11-5.2 mAb elicits a robust calcium response, the 10-3.6 mAb fails to elicit a detectable response. Subsequent investigation revealed that whereas the 10-3.6 mAb is able to bind all I-Ak class II molecules, the 11-5.2 mAb recognizes the conformational epitope Ia.2 that is only present on ∼10% of cell surface I-Ak class II molecules (21). Further study revealed that these 11-5.2–reactive I-Ak molecules are a conformational variant formed upon pairing of the I-Ak α-chain TM domain M1 GxxxG motif with the single β-chain GxxxG motif [Fig. 1A, (22, 25)]. Moreover, these signaling-competent M1 I-Ak class II molecules are enriched in cholesterol-rich plasma membrane lipid rafts that frequently serve as receptor-signaling platforms (21), and depletion of membrane cholesterol impairs formation of the Ia.2+ M1 I-Ak class II (19, 20). However, the lack of signaling upon 10-3.6 engagement of all I-Ak molecules (both M1- and M2-paired) suggested that Ia.2– M2 I-Ak class II may be able to somehow “attenuate” M1 I-Ak class II calcium signaling. The goal of this study was to investigate that possibility. The key finding of this study is that tethering of Ia.2+ M1 and Ia.2– M2 I-Ak molecules with a nonmultimerized form of the 10-3.6 mAb blocks the M1 I-Ak–driven calcium response normally seen upon binding of multimerized 11-5.2 (Fig. 1). The inhibitory effect of M2-paired I-Ak is not due to a global attenuation of B cell calcium signaling (Fig. 2) and requires close physical proximity between the different class II conformers (Fig. 3). Finally, the M2 MHCII inhibitory effect can be mimicked by tethering Ia.2+ M1 class II to either CD45, which has a cytosolic phosphatase domain (32), or FcγRIIB, which has a cytoplasmic ITIM motif that can recruit phosphatases such as SHIP (33) (Fig. 4). These results suggest that M2 class II may have an associated phosphatase activity that attenuates M1 MHCII ITAM-like calcium signaling. Although the identification of the molecular basis of this presumptive phosphatase activity will require further investigation, one candidate is the protein STING, which was originally identified as an MHCII-associated protein and which possesses an ITIM motif (3, 34). One question that comes from these findings is, how might the cross-talk between Ia.2+ M1 and Ia.2– M2 MHCII play into T cell regulation of B cell activation? Previously, we have shown that whereas peptides derived from the processing of BCR-bound cognate Ags are selectively loaded onto Ia.2+ M1 MHCII (12, 27), peptides derived from Ags internalized by fluid-phase endocytosis, as would happen for abundant self-antigens in a non–self-reactive B cell, are loaded onto both M1 and M2 MHCII (27). This would suggest that T cell/TCR engagement of BCR-generated M1 peptide–MHCII would drive B cell activation, whereas T cell/TCR engagement of fluid phase–generated M1+M2 peptide–MHCII would maintain B cell quiescence This is consistent with our in vitro observations that T cell or mAb engagement of BCR-generated peptide–MHCII complexes drives B cell activation, whereas T cell or mAb engagement of a similar level of fluid phase–generated peptide–MHCII does not (35). This scenario is also consistent with the in vivo studies of Okada et al. (36) who found that cognate B cell–T cell interactions in the absence of cognate Ags (presumably mediated by fluid phase–generated peptide–M1+M2 MHCII) are transient in nature, whereas B–T interactions formed subsequent to the introduction of B cell cognate Ags (which would result in selective peptide loading onto M1 MHCII) are long lived and result in the B cell leading the CD4 T cell to the forming follicle. In summary, we have shown that Ia.2+ MHCII calcium signaling in B cells is the result of a balance between ITAM/kinase and ITIM/phosphatase activity, with ITAM/kinase activity being associated with Ia.2+ M1 MHCII and ITIM/phosphatase activity being associated with Ia.2– M2 MHCII. Because M1 MHCII and M2 MHCII are loaded with peptides derived from different pathways of Ag processing, the Ag specificity of any B cell–interacting CD4 T cell will likely dictate the level of MHCII PTK-dependent calcium signaling and, thus, the resulting level of B cell activation. This finding significantly improves our overall understanding of the molecular mechanisms by which T cells regulate B cell activation. We thank Heidi Tucker for technical assistance, the Albany Medical College Department of Immunology and Microbial Disease Immunology Core Facility for the support of flow cytometry resources, the Albany Medical College Animal Resources Facility for animal support services, and Dr. Amy Hahn and Lisa Drake for critical reading of the manuscript. This work was supported by National Institutes of Health Grant AI-097673.
. 2004. MHC class II signaling in antigen-presenting cells. Curr. Opin. Immunol. 16: 108–113. 2018. Class II MHC cytoplasmic domain-mediated signaling in B cells: a tail of two signals. Hum. Immunol. DOI: 10.1016/j.humimm.2018.07.232.
. 2018. B cell MHC class II signaling: a story of life and death. Hum. Immunol. DOI: 10.1016/j.humimm.2018.04.013.
. 1995. The cytoplasmic and transmembrane domains of MHC class II beta chains deliver distinct signals required for MHC class II-mediated B cell activation. Immunity 3: 349–358.
. 1989. Ia-mediated signal transduction leads to proliferation of primed B lymphocytes. J. Exp. Med. 170: 877–886.
. 2008. MHC class II structural requirements for the association with Igalpha/beta, and signaling of calcium mobilization and cell death. Immunol. Lett. 116: 184–194.
. 2000. Ligation of HLA-DR molecules on B cells induces enhanced expression of IgM heavy chain genes in association with Syk activation. J. Biol. Chem. 275: 34998–35005.
. 1992. B-cell proliferation initiated by Ia cross-linking and sustained by interleukins leads to class switching but not somatic mutation in vitro. Immunology 75: 116–121.
. 2002. MHC class II isotype-specific signaling complex on human B cells. Eur. J. Immunol. 32: 2282–2291.
. 2001. TCR-induced transmembrane signaling by peptide/MHC class II via associated Ig-alpha/beta dimers. Science 291: 1537–1540.
. 2015. Antigen-B cell receptor complexes associate with intracellular major histocompatibility complex (MHC) class II molecules. J. Biol. Chem. 290: 27101–27112. 2018. The immunobiology of ubiquitin-dependent B cell receptor functions. Mol. Immunol. 101: 146–154.
. 2003. Lipid raft-dependent and -independent signaling through HLA-DR molecules. J. Biol. Chem. 278: 7099–7107.
. 2011. SCIMP, a transmembrane adaptor protein involved in major histocompatibility complex class II signaling. Mol. Cell. Biol. 31: 4550–4562.
. 1999. Intracellular phosphotyrosine induction by major histocompatibility complex class II requires co-aggregation with membrane rafts. J. Biol. Chem. 274: 22591–22596.
. 1984. Cysteines in the transmembrane region of major histocompatibility complex antigens are fatty acylated via thioester bonds. J. Biol. Chem. 259: 7230–7238.
. 2009. Lipid-mediated presentation of MHC class II molecules guides thymocytes to the CD4 lineage. Eur. J. Immunol. 39: 96–112.
. 2013. Cholesterol lowering drug may influence cellular immune response by altering MHC II function. J. Lipid Res. 54: 3106–3115.
. 2016. Cholesterol corrects altered conformation of MHC-II protein in leishmania donovani infected macrophages: implication in therapy. PLoS Negl. Trop. Dis. 10: e0004710.
. 2011. The Ia.2 epitope defines a subset of lipid raft-resident MHC class II molecules crucial to effective antigen presentation. J. Immunol. 186: 6710–6717.
. 2014. Differential transmembrane domain GXXXG motif pairing impacts major histocompatibility complex (MHC) class II structure. J. Biol. Chem. 289: 11695–11703.
. 2018. Role of membrane environment and membrane-spanning protein regions in assembly and function of the class II major histocompatibility complex. Hum. Immunol. DOI: 10.1016/j.humimm.2018.07.004.
. 2006. Dynamics of MHC class II-activating signals in murine resting B cells. J. Immunol. 176: 827–838.
. 2016. A triad of molecular regions contribute to the formation of two distinct MHC class II conformers. Mol. Immunol. 74: 59–70.
. 2010. Evidence for role of transmembrane helix-helix interactions in the assembly of the Class II major histocompatibility complex. Mol. Biosyst. 6: 1650–1661.
. 2016. Immunological functions of the membrane proximal region of MHC class II molecules. F1000 Res. 5: 368.
. 1981. Inhibition of T cell activation in vivo with mixtures of monoclonal antibodies specific for I-A and I-A/E molecules. J. Exp. Med. 154: 188–192.
. 1986. Unexpected expression of a unique mixed-isotype class II MHC molecule by transfected L-cells. Nature 320: 72–75.
. 2010. Distinct MHC class II molecules are associated on the dendritic cell surface in cholesterol-dependent membrane microdomains. J. Biol. Chem. 285: 35303–35310.
. 2011. Identification and characterization of a loss-of-function human MPYS variant. Genes Immun. 12: 263–269.
. 2009. CD45, CD148, and Lyp/Pep: critical phosphatases regulating Src family kinase signaling networks in immune cells. Immunol. Rev. 228: 288–311.
. 2008. Fcgamma receptors as regulators of immune responses. Nat. Rev. Immunol. 8: 34–47.
. 2008. MPYS, a novel membrane tetraspanner, is associated with major histocompatibility complex class II and mediates transduction of apoptotic signals. Mol. Cell. Biol. 28: 5014–5026.
. 2005. The pathway of antigen uptake and processing dictates MHC class II-mediated B cell survival and activation. J. Immunol. 174: 1306–1316.